There is a Kickstarter project, recently launched by former Second Life developer Judy L. Tyrer, that seems like a deliberate counter to the current state of videogames. 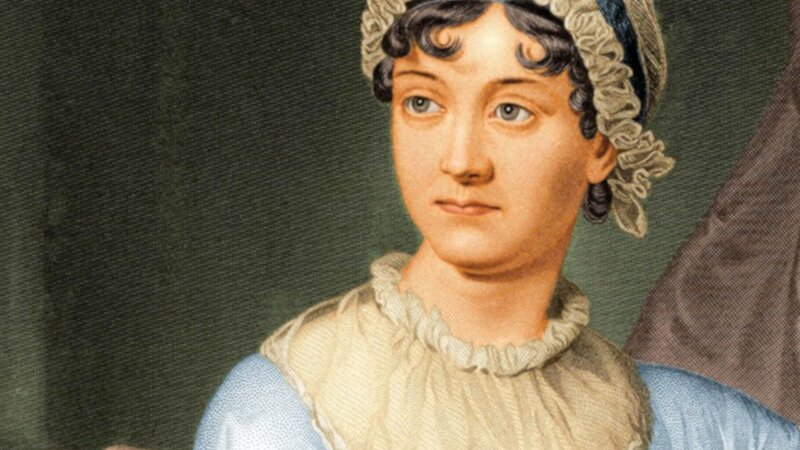 Ever, Jane, the project in question, is a massively multiplayer online role-playing game (MMORPG) based on the work of 18th/19th century author Jane Austen. Its goal is a simple yet fairly ingenious one: Ever, Jane wants to take the traditionally violent objectives of games like World of Warcraft and Everquest and use them as a model for an entirely pacific, social experience. This type of approach seems like something that videogames as a whole could definitely benefit from. As the next generation of game consoles hits the North American market this month, a project like Ever, Jane is well worth looking at. The launch lineup of both the PlayStation 4 and Xbox One is comprised of fairly predictable entries, including military shooters like Call of Duty: Ghosts and Battlefield 4, open-world action titles such as Dead Rising 3 and Assassin’s Creed IV: Black Flag, as well as fighting games like Injustice: Gods Among Us Ultimate Edition and the rebooted Killer Instinct. A common thread runs through all of these — the use of violence to accomplish gameplay objectives. Of course, this is nothing new. Games, even ones as seemingly innocuous as Super Mario Bros. or Sonic the Hedgehog, use physical conflict as a way to keep players alert. Running into an enemy is bad, so punch or jump on them to make a level easier to navigate. Getting shot by another player is bad, so shoot them first in order to succeed in a multiplayer match. These are the kind of tasks that videogame players take for granted. Sure, many adventure, racing, simulation, and puzzle games manage to do away with violence entirely, but there is always room for other innovative takes on traditional gameplay objectives. The playable prototype of Ever, Jane is extremely rough around the edges as is probably to be expected from a work that has yet to even be funded. Nonetheless there is real promise to the idea. My brief time spent exploring a small English town as ConsumptionGal86 demonstrated an extremely interesting take on not only MMORPGS, but traditional gameplay mechanics as well. Ever, Jane runs with the nascent relationship systems found in a Mass Effect or Dragon Age and attempts to codify them even further. Instead of killing goblins to gain experience points, Ever, Jane asks players to keep an ear out for gossip; rather than test their combat prowess in raids against giant dragons, Ever, Jane has grand parties where characters can advance their skills through dancing and engaging with other guests. The focus of the game is even reflected in how players will be able to allocate their avatar’s various attributes. Social traits like Happiness and Status will affect the ease of navigating the game in place of martial skills such as Strength or Dexterity. 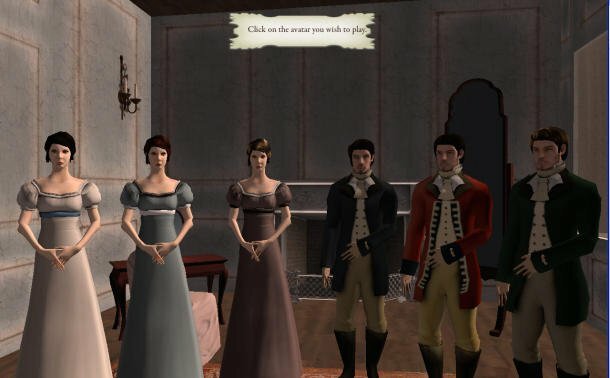 Rather than create systems that serve to make the audience better at fighting monsters, the Jane Austen game is more concerned with exploring the gameplay possibilities found within the intricate etiquette structures of Regency Era England. This type of game won’t appeal to everyone. Luckily, it doesn’t need to. There are people who love reading books who don’t care for Jane Austen, but few would argue that the medium of literature isn’t better off for including works like Pride and Prejudice, Emma, or Northanger Abbey. Mainstream games, as evidenced by the titles hitting shelves alongside Microsoft and Sony’s glossy new machines, are confined to a fairly small grouping of profitable genre types. This shouldn’t be the case. We need as many different types of games as possible in order to expand our understanding of what a videogame is. There will be people who balk at the idea of an MMORPG where swordplay and spellcasting are replaced with gossip and curtseying, but isn’t Ever, Jane a welcome change of pace? 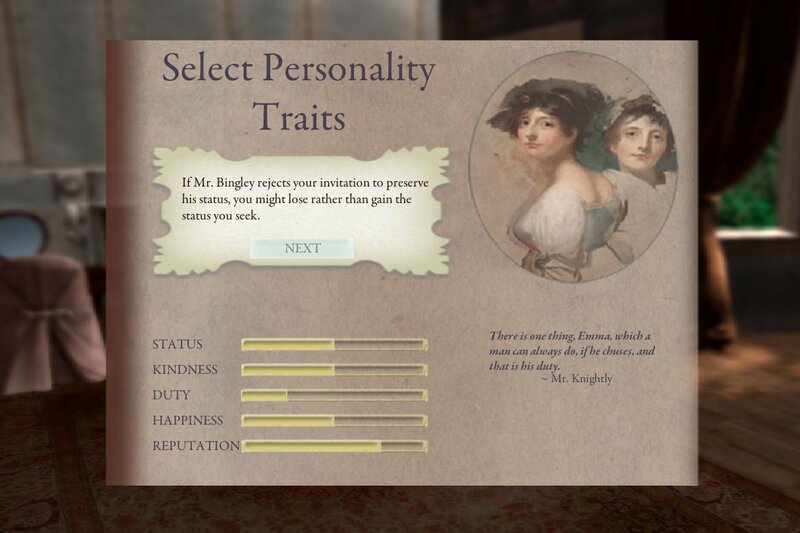 Maybe a Jane Austen game is exactly what we need.